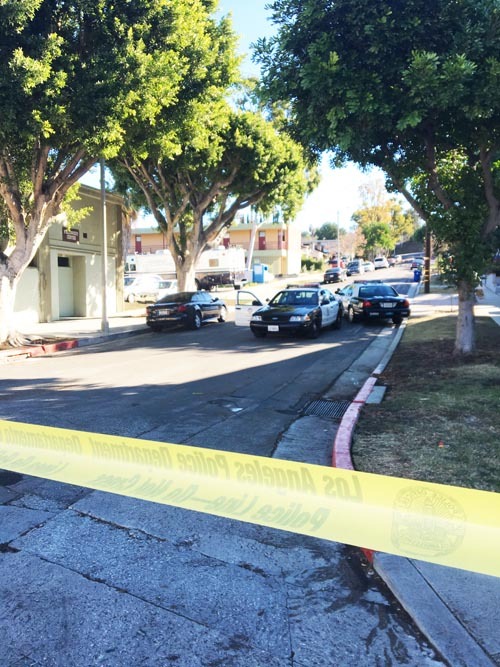 BOYLE HEIGHTS – A 14-year-old boy killed in an officer-involved shooting in Boyle Heights was seen by a witness firing a handgun in the direction of officers before he was shot, police said Wednesday. No officers were injured in the shooting, which occurred at 5:50 p.m. Tuesday in the area of Breed Street and Cesar Chavez Avenue, according to the Los Angeles Police Department. Jesse James Romero of Los Angeles died at the scene, said coroner’s Assistant Chief Ed Winter. At a news conference this morning at police headquarters, LAPD Deputy Chief Robert Arcos said officers had gone to the neighborhood on a report of vandalism involving “gang writing,” and that the suspects were described as being about 14-16 years of age. Arcos said officers spotted two suspects, and one fled on foot. “According to a witness, who saw the subject running from the officers, the witness saw the subject shoot a handgun in the direction of the pursuing officers,” Arcos said. He said the pursuing officers heard a gunshot as they approached a corner during the pursuit. “As the officers rounded the corner, one of the officers became involved in an officer-involved shooting,” he said. Arcos told reporters he could not say if the officer who shot Romero was under fire at the time the teen was shot. The investigation was “ongoing” and officers were still being interviewed, he said. Officers were wearing body cameras, and the recorded images will be part of the investigation, Arcos said. Also, Arcos said he could not say if Romero was involved in gangs. At the news conference, police displayed a large photo of what they said was a loaded revolver that was recovered at the shooting scene. The handgun is being tested for DNA and fingerprints, Arcos aid. In an earlier briefing from the scene of the shooting, LAPD Detective Meghan Aguilar said Gang Enforcement Detail officers had gotten into the foot pursuit with suspects in the area of Chicago Street and Cesar Chavez Avenue. Arcos said that so far this year, the department has had four officers fired upon and two who have been shot. “He didn’t do anything violent,” she said, noting that the family has lived in Boyle Heights for six years, and she works as a vegetable packer. “He was smart. He was friendly. He did good in school,” Miranda said. Ultimately, however, “he didn’t deserve this,” Miranda said. The shooting was the second on Tuesday that involved LAPD officers. Officers shot and wounded a man shortly after 2 a.m. Tuesday during a traffic stop in the 5500 block of Nordyke Street near Eagle Rock, according to the LAPD. The suspect in that shooting, a man in his 30s, was hospitalized in stable condition. A handgun was recovered at the shooting scene, police said. An armed man who allegedly confronted an off-duty LAPD officer today in the Montecito Heights area of Los Angeles was critically wounded in an officer-involved shooting, police said. The shooting occurred at 2:41 a.m. in the 500 block of Wheeling Way, said Los Angeles Police Department Officer Ricardo Hernandez. The officer who opened fire was off-duty at the time and not injured, Hernandez said. The suspect was taken to a hospital in critical condition. The officer was “securing his vehicle” when the shooting occurred, LAPD Sgt. Barry Montgomery said. “It was at that time, while he was at his vehicle, he was confronted by an armed male suspect, and an officer-involved shooting followed,” Montgomery said. A 16-year-old boy suffered a graze wound to his upper torso in a deputy-involved shooting in East Los Angeles, a sheriff’s deputy said Monday. The teenager was in a vehicle wanted in connection with a possible assault with weapon attack that occurred in the area of South Indiana and Dennison streets, said Deputy Tony Moore of the Sheriff’s Information Bureau. Deputies responding to the scene at 9 p.m. Saturday spotted a vehicle matching the description of the suspect’s vehicle and tried to conduct a traffic stop. One of the occupants got out and ran eastbound on Dennison Street, Moore said. Deputies chased the suspect, who turned around and pointed a handgun at them, which resulted in a deputy-involved shooting, he said. The suspect continued running and additional deputies were called in to search for the boy. He was later found hiding in the backyard of a home in the 1000 block of South Townsend Avenue and taken into custody. The firearm pointed at deputies was also recovered, Moore said. The teenager was treated at the scene by paramedics then transported to sheriff’s East Los Angeles station and booked on suspicion of assault with a deadly weapon on a peace officer.